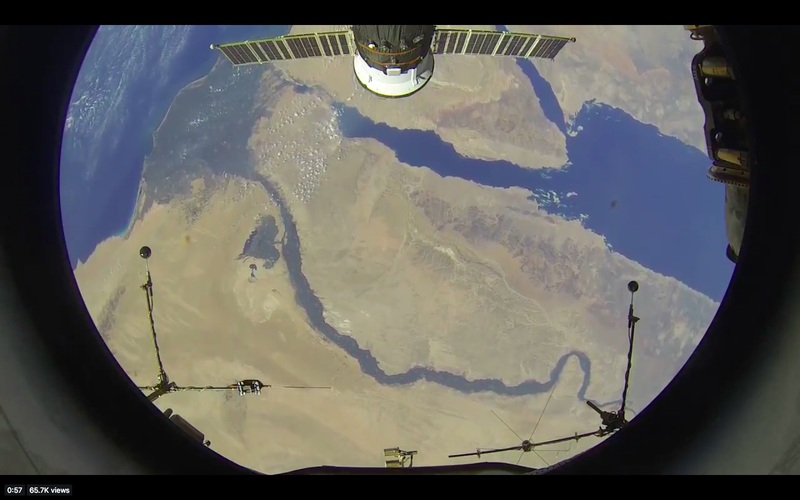 Russian Cosmonaut Oleg Artemyev's Sept 3, 2018 tweet has a narrated video of Earth from the ISS, at the time over the Nile river. The video is also in YouTube (below). At the bottom of the screen, shown in the screenshot below, there are what looks like two antennas, one on either side. They are in space and faciing towards the Earth. They might also be supports for other sensors, or something else entirely. What are these structures called and what are their functions? below: Screenshot of the tweeted video. Click for full size. They appear to be associated with a plasma wave experiment called Obstanovka (lower left of this picture, in red). Source is this presentation. Bonus: I believe the video was shot through the 16-inch Service Module window 9, the one you link to in the question. In the first image in my answer, this window and its cover are shown surrounded by purple color. research of space weather conditions in equatorial, middle-latitude and sub-aurora ionosphere. to analyze the concentration of ionosphere plasma close to ISS. spectra of VLF electromagnetic fluctuations. For the study of discharge effects in NES plasma the PWC structure includes also the device for discharge stimulation. The LP development is funded by National Space Program of Bulgaria. It is scheduled to be available for flight to the end of 2004. The given electrostatic probes have operated aboard numerous “Intercosmos” satellites, heavy geophysical rockets “Vertical”, and have been included in the payload of Mars-96 mission. The potential difference measurement between a probe and ISS body is the main scientific aim of the device DP. This allows us to study of the ISS electric charging processes and the time variation of the electric potential. The existence of two identical devices DP1-1 and DP1- 2, which are mounted on every block CWD, allows us also to measure the spatial electric field in NSZ. The potential difference can be measured in the range ± 200 V. The existence of such high potential values admits charging mechanisms, different from collecting of conducting particles in the plasma. The device DP also provides an estimation of the contact layer resistance of the system plasma – probe. If there is an opportunity for the probe to be replaced by an astronaut, this will permit the study of the influence of the probe geometric and constructional characteristics on the potential difference measurement. The device DP is an electronic module which measures the potential difference in range ± 200 V, which is divided in two sub-ranges: ± 20V and ± 200 V. The subranges are switched automatically. A 12-bit ADC (Fig. 3) provides potential difference measurements with resolution 10 mV (± 20 V) and 100 mV (± 200 V). ‘research’ - a selectable frequency of the measurements. The main purpose of the CORES is to study the electron population in the ISS vicinity. Electron velocity distribution functions are measured in fast time resolution as well as kilo-Hertz and Mega-Hertz modulations in the electrons resulting from waveparticle interactions. Electrons in the energy range 10eV up to 10keV are measured over a 360o field of view (FOV) with energy spectra resolved at typically at ~0.1s time resolution with simultaneous measurements of electron modulations in the frequency ranges: 0-10MHz (HF); 0-10kHz (VLF); and 0-150Hz (ELF). The CORES is a single module containing all of the components necessary for electron energy resolving and electron detection via microchannel plates (MCP) with associated High Voltage supplies (HV) and includes fast processing using field programmable gate arrays (FPGA) with a microcontroller Data Processing Unit (DPU) interfacing to the Telemetry (TM) and Telecommand (TC) interfaces, I/F of the On-Board Data Handling Unit, OBDH (Fig. 4). Combined wave sensors CWS1, CWS2 (LEMI-603) are intended for measurement of one component of magnetic field variations (B-channel), current density (I-channel) and electric potential (E-channel) of ionosphere space plasma. An additional channel for measurement of the sensor block temperature is included. Each of probes consists of two units. The first unit is a block of sensors CWD-PS and the second one is the set of electronic unit CWD-SC. The CWD operation block diagram is given on Fig. 5. According to project requirements, a new model of space magnetometer DFM2 (LEMI-012) is developed. The magnetometer LEMI-012 is intended for automatic measurement of three components of DC magnetic field induction. The instrument represents measurements results in the digital form, has high accuracy of measurements and linearity, and has builtin correction of temperature error. It allows receiving authentic information about temporal variations of the Earth magnetic field vector components in orbital flight. DFM1 is one of two magnetometer using in the PWC of scientific instrumentation The instrument is three components flux-gate magnetometer measuring DC magnetic field induction. The measurement has high accuracy of measurements and linearity. Beside three components DC field the instrument give possibility to get data about magnetic field pulsation and fluctuation (one component) in five frequency band: 55, 110, 165, 400 and 800 Hz. There is possibility to use additionally two bands. The wide of bands is 10 Hz. The measurements region in the band is 0.1 – 100 nT. 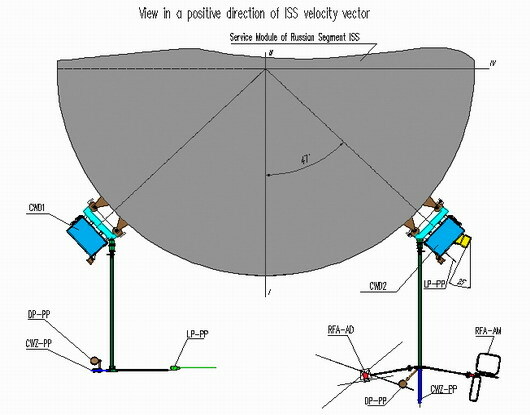 The continuous monitoring of ULF-VLF electromagnetic environment on board of ISS by an advanced SAS system (SAS3-ISS) and by simultaneous ground based measurements in ULF-VLF bands is important in the following areas: a) Investigation and verification of the direction of Poynting vector, wave normal and wave energy propagation, using the whole SAS3-ISS configuration. b) The investigation of the possible relationship between the seismic activity and ULF-VLF phenomena that may be related to earthquake events. c) The continuous monitoring of general ULF-ELFVLF activity in the near-Earth space ─ including ELF-VLF pollution. d) The monitoring of natural and man-made variations of the plasmasphere by whistlers. e) Investigation of electromagnetic background and space weather phenomena. f) Investigation of the effect of the large ISS structure to the propagating wave-front. The SAS3-ISS is a complex measuring system containing five main parts in the final configuration. This system measures, digitizes the incoming ULFELF-VLF signals in the 1 Hz − 25 kHz frequency range (at the actual position of ISS) using high and low sampling rates. The main purpose of this instrument is to measure natural and man-made electromagnetic emissions in the frequency range 100 kHz up to 15 MHz. This frequency range covers high frequency whistler waves, Langmuir and upper hybrid modes of the natural plasma. Thus, this instrument can be used as a versatile device for studying nonlinear effects of local plasma resonances, radio transmissions from the ground, and ISS generated noise in the above mentioned frequency range. The station-generated noise is largely unknown, and therefore the investigation in this area could bring interesting results with both scientific as well as technical aspects. Particularly, it is expected that interference between station-generated electromagnetic emissions and natural local resonances in plasma could provide new, unknown results. This instrument is a joint enterprise between the Space Research Centre in Warsaw, Poland and the Swedish Institute of Space Physics in Uppsala, Sweden. New digital technology of this instrument makes a fully programmable device that can be easily adapted to any scientific/technical objectives and telemetry capabilities. The functional block diagram of RFA is shown on Figure 8. and instrument main characteristic is given on Table 8. SPP is the original tool for realization of calibration practically of all PWC sensors. The electrical discharge gives a wide spectrum of electromagnetic radiation and also is a source of the accelerated particles. The concrete parameters SPP will be fulfilled during tests of laboratory models of the PWC sensors. Kirov B., „An instrument for measuring the surface charging of the International Space Station”, to be published in a special issue of Bulletin of the Faculty of Science, Cairo University, ISSN 1110-0966 with Proceedings of the IAGA Symposium “Space Weather and its Effects on Spacecraft”, October 5-9, 2008. 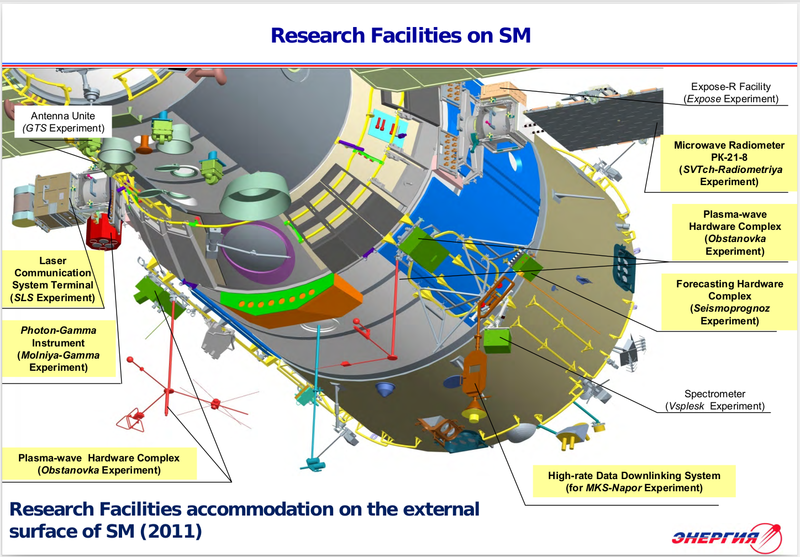 Organization and support of ecological low-frequency electromagnetic monitoring of environmental disturbances based upon facilities and hardware; taking plasma-wave measurements onboard the ISS under basic research programs devoted to Sun-Earth relations in the most active ionospheric area - F2 layer. Generation of experimental database on Earth ionospheric electromagnetic state in order to detect and prevent its disastrous changes. Determining spectral density of electromagnetic, electrostatic and magnetic fields in the frequency range from a fraction of Hz to tens of megaHz in the stage of single-axis measurements on exposure to different orbital flight factors, including effects of artificial origin. Measurements of Earth magnetic field intensity vectors along flight course. Determining plasma particles flow density fluctuation spectra. PWC complex incorporates KVD1 and KVD2 units attached to adapters and a set of sensors accommodated on two collapsible rods, as well as telemetry information storage unit (TISU) with replaceable recorder unit (RRU). Study of the problem of ensured long-term sustained operation of superlarge SC in orbit by analyzing sufficiently large quantity of accumulated full-scale experimental data on electromagnetic environment (EME). Service and scientific TMI downlinked to the ground over БИТС 2-12 channels, as well as recorded on БСПН hard disk and replaceable recorder unit (RRU). Not the answer you're looking for? Browse other questions tagged iss russia identify-this-object antenna or ask your own question. Is this ginormous porthole a permanent feature of the ISS or “just passing through”? What actually happened here with a satellite, the ISS and the moon? Why is this rocket transparent, and why is there a nozzle in the nose, pointing up?